Why should I care about DPNs (face flesh moles)? 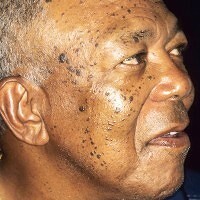 Dermatosis papulosa nigra (DPN) is a unique skin condition seen primarily in persons of color. It appears as small, dark bumps and most commonly affects the forehead, cheeks, and neck. The bumps increase in size and number over time, initially appearing in people ages 20-30. Some people call them “flesh moles.” Bill Cosby, Morgan Freeman and Condoleezza Rice are notable people with the condition. It tends to occur slightly more frequently in women than in men. The cause of dermatosis papulosa nigra is uncertain. There is a strong genetic basis for the disorder, and oftentimes the lesions can be seen in several members of the same family. Under the microscope, the lesions are a type of keratosis that is harmless. 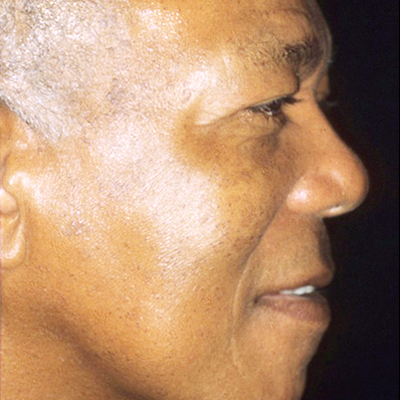 Dermatosis papulosa nigra is not a skin cancer, and it will not turn into a skin cancer. The diagnosis is easily made by a dermatologist. No, because it is passed on genetically. One can treat the bumps when they are small to prevent them from becoming obvious and maintain a regular treatment program (every 1-4 years) to keep them away. Generally speaking, no treatment is necessary other than for cosmetic concerns. In certain circumstances, if the lesions are symptomatic (painful, inflamed or itchy) or cosmetically undesirable, the lesions can be treated via a minor in-office surgical procedure with excellent results. Your doctor will review treatment options with you and recommend the one that is most appropriate for your condition. Realize the condition is inherited and occurs later in life but does not turn into skin cancer. The spots may get worse over time, and they can be removed if they are irritated or unwanted. If DPN is undesirable, there are techniques used by an experienced dermatologist to provide excellent treatment results. 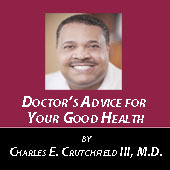 Charles E. Crutchfield III, MD is a board-certified dermatologist and Clinical Professor of Dermatology at the University of Minnesota Medical School. He also has a private practice in Eagan, MN. He has been selected as one of the top 10 dermatologists in the United States by Black Enterprise magazine and one of the top 21 African American physicians in the U.S. by the Atlanta Post. Dr. Crutchfield is an active member of the Minnesota Association of Black Physicians, MABP.org. Do you recommend getting the moles scraped or lasered off? What’s up with the word “nigra” in dermatosis papulosa nigra? What is the origin? I find it highly offensive. Please don’t be offended. It is a medical term. Nigra is a Latin word. Is there a link between DPN and aging ? I have heard that people with moles, particularly dark skin, tend to have a slower aging process . Is there any proven correlation ? Often black dots, representing the blood veessels which feed the wart, are visible. off those pumice stones or several fine sand papers. do for partial the price. If these warts at so easily removed, why do people like Morgan Freeman and Bill Cosby let them colonize all over their faces? These guys’ faces are important for making a living. I’m not saying their faces should be flawless. But with all their money, one would expect them to be spending some on fixing their facds.